From Mt. Pleasant: Take 526 to I -26 West to North Charleston Exit 205-B (Hwy 78/University Blvd.). Follow University Blvd. through two traffic lights. Elms Plantation Blvd will be on your left. Our practice is located at the intersection of University Blvd and Elms Plantation Blvd. From Downtown: Follow I -26 West to North Charleston Exit 205-B (Hwy 78/University Blvd.). Follow University Blvd. through two traffic lights. Elms Plantation Blvd will be on your left. Our practice is located at the intersection of University Blvd and Elms Plantation Blvd. From Summerville: From Bacons Bridge Road, take a right onto Berlin G. Myers Parkway. Turn right at Hwy 78/University Blvd. Follow University Blvd. through two traffic lights. Elms Plantation Blvd will be on your left. Our practice is located at the intersection of University Blvd and Elms Plantation Blvd. From Summerville: From Dorchester Road, take Ladson Road and turn right onto Hwy 78/University Blvd. Follow University Blvd. through two traffic lights. Elms Plantation Blvd will be on your left. 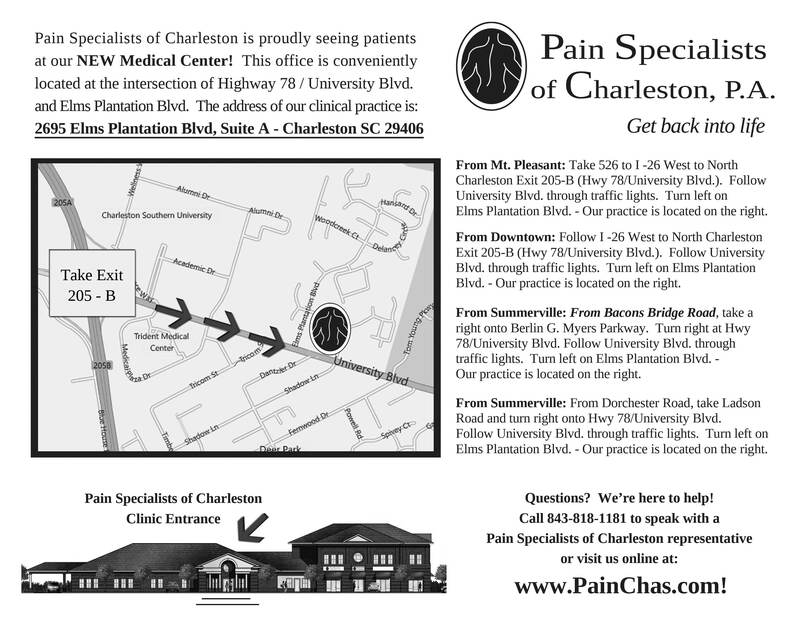 Our practice is located at the intersection of University Blvd and Elms Plantation Blvd.